We’re back, with the second installment of Amplify! I have a weird connection to our February Amplify feature, Frances Harper, but we’ll get to that later. Frances Harper initially came on to my radar as the first black woman to publish a short story, but her actual life story is just as compelling as any work of fiction. Harper was born to free black parents in Baltimore, Maryland on September 24, 1825 and only three years after that, her mother died. Harper was raised by her aunt and uncle from that point, forward (1). Harper had access to an education not only because she was born free, but also because her uncle, abolitionist William Watkins, ran Watkins Academy and allowed her to attend until the age of 13. Even after the age of 13, Harper was able to continue her education when she found work with a Quaker family, who allowed her study with their extensive literature collection and encouraged her literary endeavors (3). In 1845, her first collection of poetry, Forest Leaves (sometimes called Forest Leaves) was published. In 1850, when Harper was 25 years old, Maryland passed the Fugitive Slave Act, a law permitting the capture and sale of any black person, regardless of if they were already free or not. Because of this, her family fled from Baltimore and Harper moved to Ohio on her own. In Ohio, she taught “domestic” skills at Union Seminary, which was run by abolitionist John Brown. Harper really devoted herself to the abolitionist cause and began traveling on a lecture circuit, contributing almost all of her earnings back to her uncle to help support the Underground Railroad (1, 2). By 1851, she moved to Pennsylvania to further help the Underground Railroad (3). It was in Pennsylvania that her career truly blossomed. Harper published her poetry collection, Poems of Miscellaneous Subjects, that included one of her most popular poems, “Bury Me In Free Land”. It was also in this time that she became a notable lecturer, making appearances with the likes of Frederick Douglass, William Garrison, Lucretia Mott, and Lucy Stone (1). 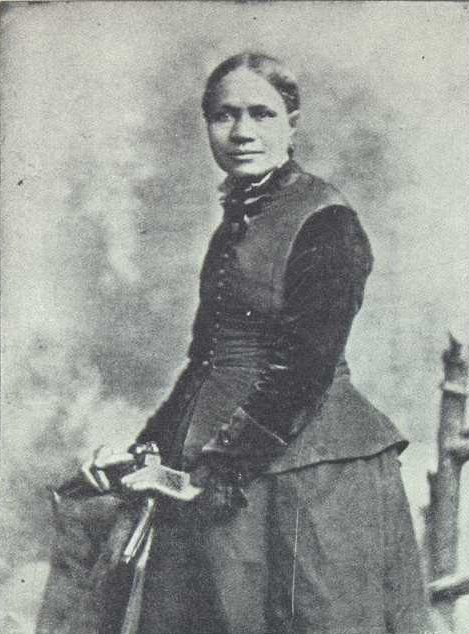 In 1859, Two Offers was published, making Harper the first black woman to have a published short story. Shortly after publishing Two Offers, Harper married her husband, Fenton, in 1860 and faded from the public eye. Frances Harper, being no stranger to loss, was forced back to the lecture circuit and public eye in 1864, after the birth of her daughter and death of her new husband, as a means to support her family (1). In the latter half of her life, Harper settled in Philadelphia and joined the First Unitarian Church. It is theorized that Harper joined the Unitarian church for as many political reason as she had spiritual reasons; Unitarian churches were a rare place where people of different races were able to interact and work together, which allowed Harper access to influence she would not have received in more traditional churches, typically divided by race (3). Harper spent much of her time in Philly working in her community. In 1873, she became Superintendent of the Colored Section of the Philadelphia and Pennsylvania Women's Christian Temperance Union. Harper often spoke and wrote on the evils of alcohol, as she was a very vocal member of the Temperance movement. In 1894, she helped found the National Association of Colored Women and served as its vice president from 1895 to her death in 1911 (3). In 1896, Harper co-founded the National Association of Colored Women with Ida B. Wells, Harriet Tubman and several others (1). She continued writing as well, publishing her last and most famous long piece of literature, Iola Leroy, in 1892. Harper died of heart failure on February 22, 1911, in Philadelphia. HerStory readers, remember when I said I felt I had a weird connection to this month’s Amplify feature? Well, February 22 is my birthday. I’m not excited that someone died on my birthday, but it does make me feel connected to that person in a way that I can’t quite articulate – that’s another topic to explore another day, though. I digress. Harper was buried next to her daughter, who died two years prior. In the end, Harper was not critically acclaimed writer, even though she was very popular. Her work and name slowly faded toward oblivion. Her headstone fell over and sunk into the ground. It wasn’t until recently that black women and feminists in general started working to reignite her legacy. In 1992, on the 100th Anniversary of Iola Leroy, her headstone was replaced in a celebratory ceremony lead by African-American Unitarian Universalists (3). There is so much more to Frances Harper, and here at HerStory we’re working to just introduce you to the incredible women of our past. I’ve linked the referenced articles directly following the column. Please share with us any interesting facts you might learn (or already know) about Frances Harper throughout the month, and we’ll share them with our HerStory community! Please take the time to review the Frances Harper timeline we’ve put together and take time to read Frances Harper’s writing. Harper’s poetry has been collected in Complete Poems of Frances E.W. Harper, edited by Maryemma Graham and her prose in can be found in A Brighter Coming Day edited by Frances Smith Foster. 1850 - Moves to Ohio and taught domestic skills at Union Seminary, run by Abolitionist John Brown. Fugitive Slave Law is passed. 1873 - Becomes Superintendent of the Colored Section of the Philadelphia and Pennsylvania Women's Christian Temperance Union.